Mark Hodgson hit 55 for Oundle. Awesome Aussie Blake Mills blasted Ramsey into the quarter-finals of the Jaidka Cup last night (May 25). The Raiders were in some trouble chasing March Crows’ 154-4 at Cricketfield Lane when Mills strode to the crease. Ryan Evans was in good form for Castor. He promptly smashed 74 from 28 balls (seven sixes, six fours) to help his side to a three-wicket win. Toby Nulty (46 from 36 balls) batted well late on for March. Ramsey will now travel to Peterborough Town or Castor in the last eight on June 8. Those two face off at Bretton Gate next Wednesday (June 1) with the winners hosting Ramsey and the losers travelling to Wisbech. 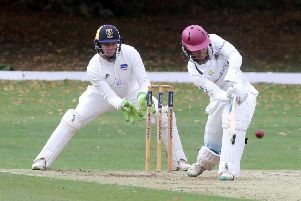 Castor pipped Barnack by five runs in a low scoring game at Port Lane last night. The home side successfully defended 95-9 with Ryan Evans (27 & 4-10) enjoying a fine all-round game. Bourne and Oundle will entertain Nassington and Market Deeping respectively in the quarter-finals. Bourne beat neighbours Deeping by 26 runs at Outgang Road. Sam Evison cracked 75 of Bourne’s 177-5 before Deeping openers Nick Green and Zac Simmonds set off at a scorching pace in reply. But the dismissal of Simmonds for 32 after an opening stand of 93 set off a collapse with all 10 wickets falling for 58. Green, who is just 15, made an excellent 57, scoring the first 30 of Deeping’s runs in the opening three overs! Oundle were well on top of their game against Nassington when play was abandoned because of bad light with four overs remaining. Mark Hodgson struck 55 of Oundle’s 155-6. Nassington were 100-4 off 16 overs when play was halted. After three weeks of action only Barnack and March have been eliminated from the 10 entrants. Castor 95-9 (R. Evans 27, S. Amir 4-9). Barnack 90 (R. Evans 4-10, A. Steels 2-15). Market Deeping 151 (Green 57, Z. Simmonds 32, R. Dunn 3 wkts, B. Stroud 3 wkts). Oundle 155-6 (M. Hodgson 55, J. Bolsover 35, M. Yoosuf 3-33). Nassington 100-4 (T. Norman 38no, J. Roberts 2-23). March 154-4 (T. Nulty 46, T. Phillips 24, A. Wright 20). Ramsey 155-7 (B. Mills 74, T. West 36, K. Ikhlaq 22). Quarter-final draw: (Ties to be played Wednesday, June 8). Bourne v Nassington, Oundle v Market Deeping, Peterborough Town or Castor v Ramsey, Wisbech v Peterborough Town or Castor.